A new version of Apple's iTunes software released Monday includes code strings that hint at a couple of new features likely to make their debut alongside new iPhone models this month, namely radio tagging capabilities and support for the Nike+ Sport Kit. 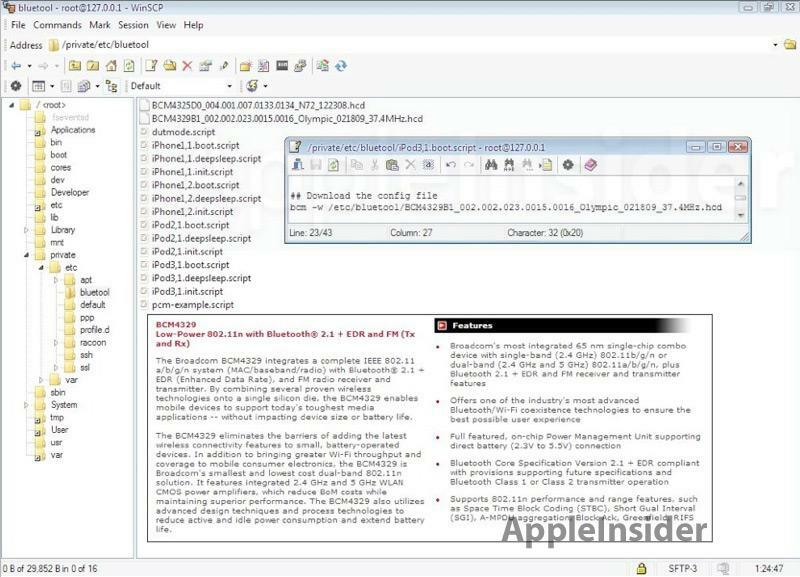 With the release of the iPhone 3.0 Software expected around WWDC next week, iTunes 8.2 was released to specifically support this new firmware. 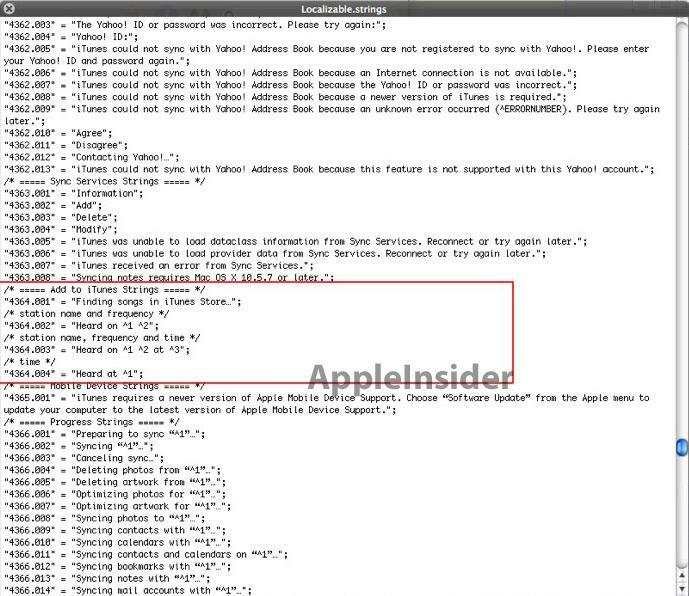 Upon close inspection of the iTunes 8.2 package, AppleInsider reader Will discovered strings that point to radio capabilities along with a corresponding ability to tag songs so that they can later be purchased from the iTunes store. These references are not visible in the same files distributed with iTunes 8.1. While the references aren't tied specifically to the iPhone, the possibility of an FM radio in next-gen models gained a bit of support from references in early iPhone 3.0 software betas to a new Broadcom chip that would enable lower-power 802.11n Wi-Fi connectivity and the ability to send and receive FM radio transmissions. For years, Apple has forgone the inclusion of built-in radio tuners in its handheld products, which initially led us to discount the prospect that the company would leverage the FM capabilities of the Broadcom chip for Radio functions in its new iPhones. Since then, however, a Chinese insider with alleged ties to employees at Apple's Taiwanese manufacturing facilities filed a report on a popular mobile forum that contained a list of specifications for one of Apple's new iPhone models. Among them were a 600MHz Samsung ARM processor, digital compass, and FM tuner. Given that some of those claims have been backed up by others in the know, an argument can be made that built-in radio capabilities no longer seem unlikely. It should be noted, however, that these references could instead mean support for a software-based radio remote application that would allow iPhones or iPods to identify names of songs when the handhelds are plugged into an accessory with FM radio hardware. They could also be nothing more than references to new capabilities of iTunes' built-in internet radio feature. The strings in iTunes 8.2 show references to a determining station names and frequency, seeming to indicate some digital radio capability. Whether this is simple FM radio with RDS capability or actual digital radio is unclear. The Apple iPod Radio Remote accessory, compatible with the iPod nano, Classic, and video models, is capable of receiving RDS signals to display artist and title information. When it comes to Nike+, a separate wireless receiver is required to use the Nike+ iPod Sport Kit with an iPod, except for the 2nd-generation iPod Touch, which has a built-in receiver. The receiver picks up transmissions from a wireless sensor placed in a shoe to track data on distance and speed, which is then logged and displayed by the iPod. This kit has not been supported by any iPhone model to date, though it is a popular feature request among iPhone owners. Unlike the iPod Touch that does not need to deal with incoming phone calls, running a Nike+ app on the iPhone will require the ability to handle incoming calls without interrupting the tracking of work-out data. A workable implementation for the iPhone would enable the Nike+ app to essentially run in the background if a call is received during a workout. Despite Nike+ being a third-party product, AppleInsider has been told that Apple actually handles a large portion of Nike+ application development for its multi-touch products, making these tweaks possible. Also remaining in iTunes 8.2 are strings that first appeared in earlier versions of the media cataloging software that point to the storage of voice memos from Apple's new Voice Memos application that will be included in the 3.0 software, the ability to use free space on the iPhone as portable storage —known as "disk use" in relation to iPods —as well as to the direct download of movies to the iPhone without the need to sync them over from a computer. 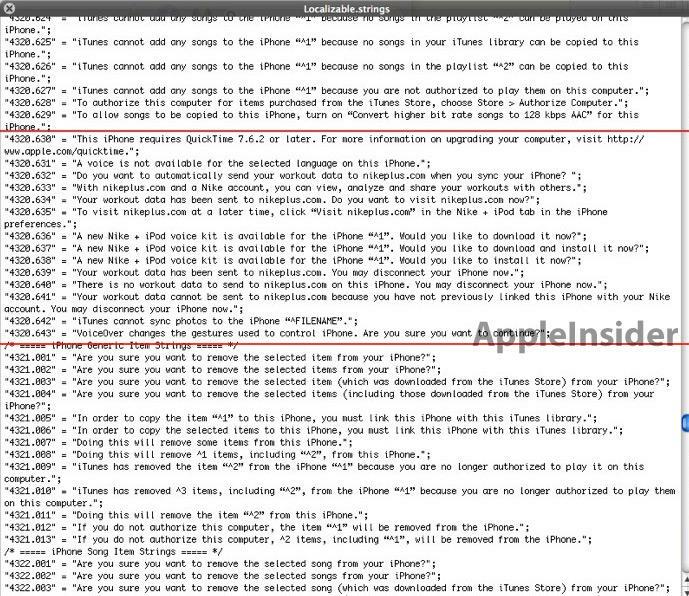 This last feature surfaced in screenshots just a few days ago showing mobile ads within an iPhone app signaling on-device video downloads from the mobile iTunes Store. The significance of the former references, and whether they're there to support upcoming features, remains unclear. Additionally, pointers to VoiceOver, a feature most recently displayed in the latest iPod Shuffle model, also made an appearance in iTunes 8.1. In 8.2, an additional string shows the ability to change VoiceOver settings to manage aspects of the Nike+ application. Despite describing over 100 new features in the iPhone Software 3.0 when it was first announced, these latest findings suggest Apple may have a few more tricks up its sleeve.